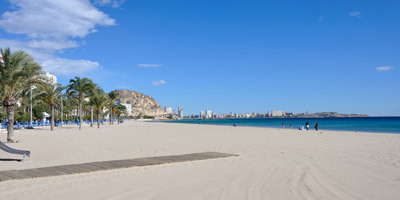 Whether you’re planning a cheeky long weekend along the Costa Blanca coastline or a full-on two week family fun packed holiday, Alicante is full of fantastic tourist attractions and great things to see and do! Here are five great places to enjoy a wonderful time with family or relax by yourself in Alicante . 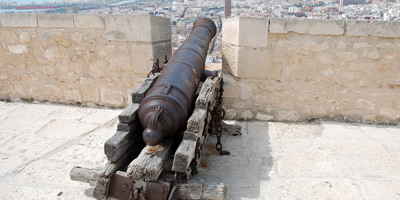 1 – Take a trip up to Santa Barbara Castle : this stunning medieval fortress looks out over the city of Alicante and has all the things you would come to expect in a castle. You can cross over the moat, explore the dark dungeons, check out the cannons, and keep watch in the lookout tower. But the best feature of the castle is its price: it’s totally free to visit. Now that is a nice touch that we don’t often see anymore: a free attraction! 2 – If it’s long sandy beaches you are looking for, then there can be only one: Playa de San Juan . This beach stretches over four miles and has some of the finest white sands you will see in Spain . But keep an eye out when sunbathing, as the beach has an 18-hole golf course alongside it, and who knows the quality of golfers playing there! Of course you also have other beaches at your disposal, such as Playa de la Albufereta next to the city centre. It is, however, always packed and full of tourists, so if you want to enjoy yourself in a more calm way, Playa de San Juan is the perfect place. 3 – Alicante city centre is one huge attraction in itself. Just stroll through the historic streets where you can admire the architecture of the buildings; it’s a great way to spend a day of your holidays! A few buildings to keep an eye out for are St. Mary’s Church, the Town Hall, and the Chapel of Santa Cruz. In these old streets you can also enjoy the finest food during the day in the best bars and restaurants of the city, or party till dawn in the most famous clubs on El Barrio Street , placed in the heart of Alicante ’s Old Town . 4 – Don’t miss the amazing Island of Tabarca ! You can take a boat from Alicante harbour to this delightful paradise. The island is full of great activities for a great day of chilling at the beach, scuba diving in clear waters, exploring endless caves, or eating delicious seafood in the famous “chiringuitos“. It only takes 30 minutes to arrive on the island. You will be able to spend the day surrounded by charming nature and enjoy an unforgettable sunset over the ocean waters. 5 – Our last recommendation takes you away from the city centre and out into the surrounding area. Make the perfect day trip to Benidorm, located only 30 minutes from Alicante city. In Benidorm you could visit one of the most famous theme parks in Spain : Terra Mítica, where you will go back to the ancient Spanish civilizations and enjoy amazing roller coasters in a magical atmosphere, perfect for kids and adults. Another great option is Terra Natura Wildlife Park, where you will find more than 150 different animal species surrounded by plants and trees from all around the world. To make sure that you can make the most of city and its surrounding area, it is a good idea to hire a car in Alicante, allowing you to explore the region with convenience and at your own pace. Whether you are travelling with friends, family, or by yourself, you are sure to find what you are looking for in Alicante , and enjoy a memorable vacation under the Spanish sun. With historical sites, beautiful architecture, white beaches, exciting activities and delicious cuisine, Alicante truly has it all!